I recall back in 1989, my boss Tony Lawrence (then Design Director at Concord Lighting) and I taking a long winding motorway trip to Lucus Aerospace Systems, Coventry, UK. Back then, it was a bit of an can-opener to the world of not merely world class quality assurance in new product development; but the commitment to what it takes to achieve a status where literally products have less than 1.3 defects out of one million: yes 1.3 out of one-million units! For those of you who are unfamiliar with 6-Sigma, it is a fact these days that 1.3 Parts Per Million (PPM) quality assurance is becoming standard. And because of that, customers expect that level of quality in everything, and that includes not just consumer gadgets, but trips on holiday, banking transaction, shopping experience, even hospital treatment and – yes – even YMCA hostels are beginning to look at 6-Sigma. 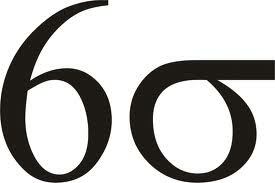 The good news is that 6-Sigma is now being rolled-out in the service industries too. In fact, the UK’s Royal Wedding last year was a 6-Sigma occasion (and now you know why it went so smoothly). Now Marks and Sparks, many large scale Law firms, and many of the best practice service institutions such as Bank One (Chase Manhattan) and Stanford University Hospital are adopting 6-Sigma. 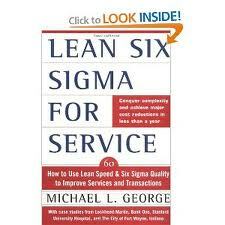 The book: Lean Six Sigma for Service: How to Use Lean Speed and Six Sigma Quality to Improve Services and Transactions, really does move all this on. It is practical, insightful and above all, useable with plenty of references to other reverent sources of information. Click here for free PDF copy. Hurry while stocks lasts @ 1.3 PPM! Aubrey de Grey is an English author and theoretician in the field of gerontology and the Chief Science Officer of the SENS Research Foundation. He is editor-in-chief of the academic journal Rejuvenation Research, author of The Mitochondrial Free Radical Theory of Aging. He is perhaps best known for his view that human beings could, in theory, live to life-spans far in excess of that which any authenticated cases have lived to today. 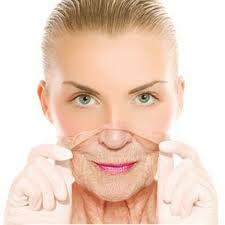 De Grey's research focuses on whether regenerative medicine can thwart the aging process. He works on the development of what he calls "Strategies for Engineered Negligible Senescence" (SENS), a tissue-repair strategy intended to rejuvenate the human body and allow negligible senescence. To this end, he has identified seven types of molecular and cellular damage caused by essential metabolic processes. SENS is a proposed panel of therapies designed to repair this damage. 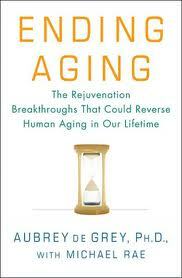 The book ‘Ending-Aging’ is not a technical book at such, but it does have few heavy medicine themes in to. However, de Grey is the one to watch when it come to the end of aging. The health and anti-aging market is worth Gazillions of Dollars, Pounds and Yen. Yet we are some way from popping pills that will halt the tides of time. Only there is more here! 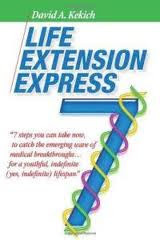 Life-Extension Express suggests to the reader that not only is the future of Life-Extension real, but lots of applied science and understanding of the mechanisms of aging is now coming to a point where we are a few decades away from off the self health and longevity! As the book makes clear, you will age, but at a slower rate for the foreseeable future. But as time rides by your physiological aging will slow faster! What about the point when you stop aging, and then even begin to reverse your physical age? What about the possibility that chronologically you are 70 years going on 35 again? Well, start planning that career you never got around to achieving; that MegaBusiness; that adventure. What a world we are beginning to live in! 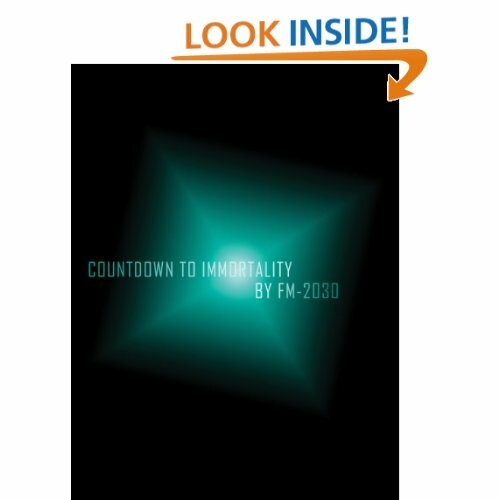 The author of this book changed his name to FM2030 to represent his passion and belief in the distant future. Your name, for example, reflects your ancestry and history. His scribe represents the future. He wrote this futures book while suffering a terminal illness back in the 1970s. It is profound, embedded with some big surprises. Dare you read it! Researchers claim that they have cracked the code when it comes to using 3D printing to create stem cells — so what happens next? Unfortunately, organ donors are few and far between. Even if you have a potential match, after spending a long time on a waiting list, conditions worsen and an organ may not be accepted. The lack of available organs is one that causes hospitals to enter continual battles over the rationing of such resources. As a surgeon I know told me, this can not only strain the relationship between different hospitals, but of course also impact patients. So what can be done, except finding artificial methods to prolong life until organs become available, or creating substitutes for organs? A new technique, pioneered by researchers at Heriot-Watt University in Scotland in collaboration with stem cell technology company Roslin Cellab, uses 3D-printing technology — otherwise used in robotics, gun manufacture and as a replacement for photography — in the hopes to eventually eliminate the need for organ donation, immunosuppressant drugs and organ transplant rejection. The new valve-based process takes advantage of the fact that stem cells can now be grown in labs. A printer creates a three-dimensional sphere which contains delicate embryonic cell cultures that float in a liquid medium. These cells are then built up using an adjustable “microvalve” to create layers and encourage cells to spawn. As stem cells can become any organ in the body, being able to quickly produce them could result in 3D-printed organs specifically tailored to a patient’s body. The team say this is the first time that cells have ever been printed using 3D-printing techniques. More importantly, the cells survived the experimental process, and in the first stages the breakthrough will be used to develop drug-testing products. 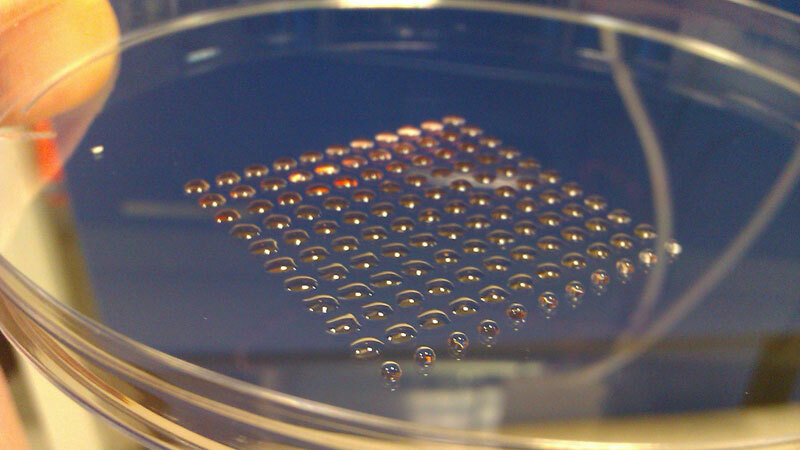 “Normally laboratory-grown cells grow in 2D but some cell types have been printed in 3D. However, up to now, human stem cell cultures have been too sensitive to manipulate in this way. 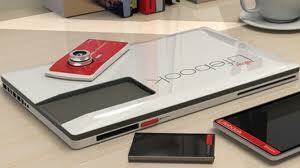 Fujitsu Hyperinnovative Lifebook Concept unites a laptop, tablet, phone and camera together in one device. Even if we've seen devices that come close, this concept takes the cake when it comes to multi-functionality. Where a keyboard would be, the laptop holds a small tablet. 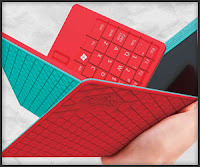 As soon as the tablet is in the slot, the tablet itself becomes a full size touch-based QWERTY Keyboard. You can detach its camera and use it as a digital camera, detach the tablet and use it as such or attach it and use it as the laptop’s keyboard or touch drawing area. What is smart? Some people judge smarts by standard benchmarks like test scores and grade point averages. Others think common sense, problem solving abilities and "street smarts" define intelligence. Standardized testing scores have proven unreliable and biased along racial and socioeconomic lines, and cramming for classes can lead to GPAs that aren't a true indicator of intelligence. While we can't all agree on a standard for intelligence, we can agree that the human brain is the key to all of them. It has a great capacity to adapt, rewire and grow. Neural networks expand and strengthen through learning experiences. Stimuli make the brain stronger and more vital. This reinforcement of the brain's power affects intelligence across all standards, from street smarts to testing scores. Here are five ways you can increase your brain's capacity to take in and store new data. Or, said more simply, here's how you can get smarter. 1. Wakeful exercises for the brain are great and necessary to help improve brain function so you can get smarter. But what about sleep? Not a whole lot is known about sleep, but we know now that scientists were wrong for years with the belief that the brain simply shut down during sleep to recharge. Research now indicates that the brain may actually do a little night time filing during sleep. The information from the previous day is catalogued and put in the proper mental folders so it can make the journey from short-term memory to long-term. Sleeping problems have been known to exacerbate other brain issues, so it makes sense that a good night's sleep can help increase the brain's function and ability to focus. It varies from person to person, but between six and eight hours of sleep for adults is generally recommended. 2. The brain, like many parts of the human body, needs regular exercise in order to maintain strength and vitality. Some more common brain strengthening exercises include fun activities like crossword puzzles, Sudoku, and other word and number-based brain teasers. There are other more academic ways as well, like completing math word problems and exercises relating to spatial relationships and geometry. Even simply reading this article gives your brain a slight workout. If these ideas are a little too scholarly for you, try simple things like mixing up your routine. Just brushing your teeth with the opposite hand or walking a different way to work forces your brain to work harder than usual, which is ultimately what you want to do. 3. In June 2010, researchers at The Sage Colleges presented findings that show certain types of bacteria commonly found in dirt made mice ‘smarter.’ The mice given Mycobacterium vaccae performed better in maze tests and showed fewer signs of anxiety and higher levels of serotonin in the forebrain, the area that takes care of higher-order thinking. The bacteria seem to promote the growth of neurons as well. This doesn't mean that we should all go out and start shoveling dirt in our mouths: You can actually ingest it by doing yard work, gardening and even by simply taking a walk through the woods. 4. The human body is all connected, so you can't take care of one part of it without benefiting some other part. Physical exercise is important for good health, for both the body and the brain. Simply increasing your blood flow kicks up the oxygen and glucose levels in the brain. The coordination it takes to perform exercises also gives the brain a workout, especially if you're trying something new. Exercise also means you're battling sedentary lifestyle, or one free from mental stimuli. Food is also important. There are many foods that have been associated with brain health, including fish oil, eggs, protein and dark green vegetables. Green tea, herbal tea and nuts are also good ‘brain food.’ Eating right, getting the required amount of sleep and exercises, both mental and physical, are the keys to improving memory and overall brain function. 5. For thousands of years, we've known the benefits of meditation. The practice of meditation can be different for each person, but it generally involves quiet, focused breathing exercises in which the practitioner is able to achieve a state of mental calm. Regardless of whether you believe that this mental calm is an enlightened state of consciousness, no one can deny the benefits of relaxed, focused breathing. FMRI scans have revealed that regular meditation also affects the actual structure of the brain. Researchers believe that memory, function, attention span and focus all benefit from meditation. One study showed that regular daily meditation can even increase the size of parts of the cerebral cortex. Not surprisingly, some of the world's leading and forward-thinking corporations offer meditation classes for their employees. And here's a question: Do you have a friend who's super smart, but when it comes to street smarts he's ... let's say ‘lacking?’ Even the smartest people pull dumb moves sometimes, and for some reason it's extra surprising and disappointing when a smart person screws up. How could that president or general carry on an affair knowing it could easily get out? How did that company CEO think he could embezzle millions and no one would find out? The truth is that book smarts or business savvy don't make a person perfect. Or streetwise. In fact, smart people seem prone to spectacular lapses in judgment more so than ‘average’ people. Of course, overconfidence isn't the only road to a dumb decision. Many of the dumb choices people make are motivated by greed, pride, stress, and even sheer laziness. Addapted from Charles W. Bryant essay on HowItWorks!